There's no such thing as a free lunch, and there's definitely no such thing as a food challenge that won't mess you up, severely. Here's the thing about food challenges: if you actually get a reward for eating something -- aside from an enjoyable experience and sustenance, of course -- you should probably be wary. 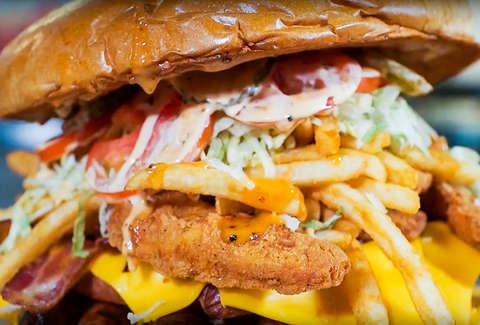 The Arizona Cardinals, the NFL's lovable losers, are taking game day food to new levels of artery-clogging excess with their Gridiron Burger: a $75, seven pound, partially fried, meat-filled, cheese-laced, affront to the sensibilities of anyone who's ever read Goop (and actually taken it seriously). It's as if Jimmy Buffet's legendary "Cheeseburger in Paradise" was covered by Marylin Manson ft. Guy Fieri. And if you finish the entire thing in under one hour, you'll receive a pro-bono Cardinals jersey (yea, unfortunately it has to be a Cardinals jersey) and your picture on the Jumbotron... wouldn't Mom be proud! Let's roll back the tape and see what's actually on this sucker. It's honestly enough food to feed a family of four... rugby players. But, if you are foolish -- sorry, brave -- enough to take the gridiron challenge, I feel like you need a game plan. If I was you, this is how I would Kobayashi this sucker. There's no way you could eat this thing like a traditional burger -- and if you can, your jaw must unhinge like a snake and certainly you should be focusing your attention on getting an endorsement deal from Ripley's Believe It or Not. So, I'd start like the aforementioned Kobayashi, I would slick my throat up with some water (or Sierra Mist) and get those down first, and quickly, a la the Nathan's Hot Dog Eating Contest. I'd take a fry break here, and eat about half of them. Consider this another de facto appetizer. Then, I'd eat all of the chicken tenders, and dip them in the included "Tank" sauce, because it's got to go somewhere. If you still have room in your stomach, congrats! You are officially the culinary Caligula that the Cardinals were hoping to attract, here. The 10-inch bun -- which is probably the most filling thing here, overall -- will need to go down at some point, and it might as well be here, at the halfway mark. To help your cause, put the 10 slices of cheese inside the bun. And if the retractable roof at University of Phoenix Stadium is open, spilling the hot desert sun onto the seats, you might be able to heat up your sandwich to grilled cheese-levels of gooeyness. I think that's all the explanation you need, here. Right now, you should be feeling pretty bad. Both gastronomically, and emotionally. Take the lettuce and tomatoes and just have a nice salad to cleanse your palate, and hopefully rectify the damage you have put yourself through in the name of 12 seconds of fame and a Josh Rosen authentic jersey. 7. Shoving the rest in, because f*ck it. Even if you somehow made it this far, you probably don't have much time left. Take the remaining half of fries and the five burgers, shove them in your mouth, and hope for the best. Hopefully your living will is updated?